We won’t remind you about how many external batteries you can buy for the money. That 7 690 rubles, you can buy decent Chinese Android smartphone. That this product is unique and the market already has a large number of decent and more affordable counterparts of the same materials, and even more impressive battery life. To talk actually I would like about more profound things. The phrase “Just look at what he thin” sounds in the presentations of the gadgets from Apple, perhaps, most often. The best minds in Cupertino are working to ensure that every year our iPhone getting thinner, consistently sacrificing not only performance, but also work offline. If we draw among fans of the company survey about what they would like more — slim case or capacious battery, it is unlikely that the majority will lean toward the first option. And now all of a sudden we got this Frankenstein — accessory, making the smartphone thicker and higher, but still hiding its stunning aluminum case silicone in something. The color of the covers do not match the colors of the smartphones themselves, but in the back of the case is emblazoned unsightly form ledge, depriving the most beautiful phone on earth, the last signs of solidity. It should be noted that laying out a lot of money for this case-the battery, the buyer still has the right to know its basic technical characteristics. If you, Mr. cook, it was unknown, then the battery capacity is measured in milliampere-hours, not hours of Internet use over LTE. We don’t care about the number of megapixels in the camera of the iPhone 6s, as long as the resulting images affect our imagination. But do you really think this time before us is the case when specification is not necessary for us to know? After coming to power, Tim cook, Apple has become increasingly look at what is happening in the market, instead of continuing to bend the line and set the trends. The focus on profit has never been so obvious, and the emergence of Smart Battery Case — another proof of that. And the fact that this case was not represented at the presentation of the iPhone 6s, likely associated with the uncertainty of the leadership of your company that the public has met with a mixed novelty with familiar delight. 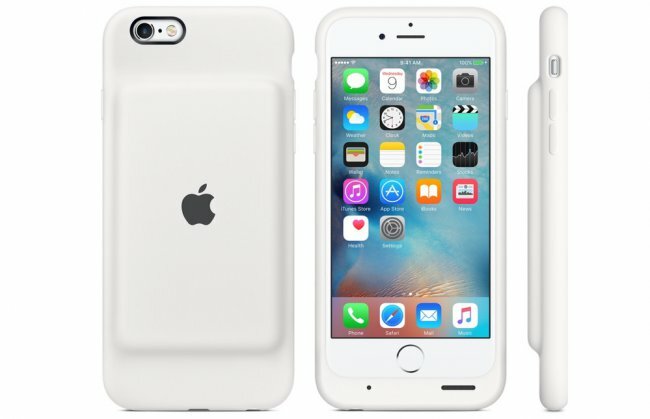 By the way, for iPhone 6 Plus and 6s Plus you are also going to release the case-the battery or it still might be a little much? This material is part of the project AppleInsider.ru we without hesitation and appeasement expressed their claims to what makes the company Apple. It’s not just the embittered corner of Hayter, and the column where we, as simple users and customers expressed their dissatisfaction about different aspects of the company. Offer friends from Apple to consider this as a constructive criticism aimed to increase the level of our satisfaction. Write in the comments to this material, do you agree with our opinion on the matter. Also we ask you to share your complaints to Apple, and perhaps your proposed topic will be covered in one of our next letters in Cupertino.